some of you may have notice that i changed my URL & blog name to FIVE FOOT SEVEN! i thought it was about time to give this little blog a slight make over. over the last year mark & i had a fun little idea to keep a jar full of funny memories throughout the entire year. 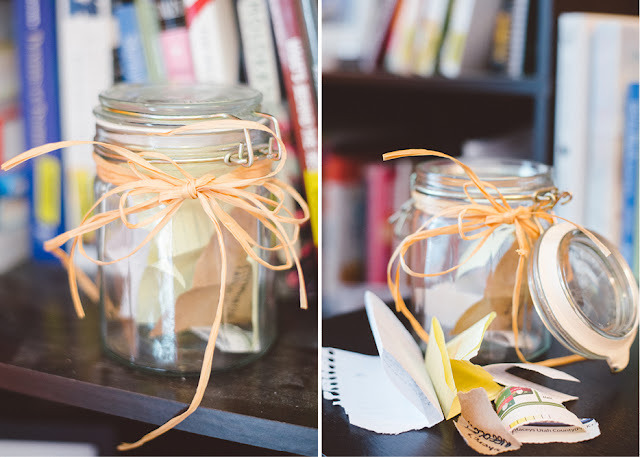 if something silly, weird or note worthy occured we would quickly write it down and stick it in this little glass jar. our plan was to open it on new years eve and remember all the funny little things that had happened over the year. we were in seattle over new years and totally forgot all about it, but for some reason we were hanging in our office last night and mark suggested we read the notes! there was only about 15 items but each one made us laugh and remember some of the fun times that we had during the past twelve months. i think this is an awesome tradition, one that may be hard to remember all year long, but something worth giving a shot! i also think i will save the ones from last year and make a little scrap book just for these little memories! those are good things to keep around too! so cute Jenna I love this idea! LOLOL ahhh yes, made up junior high stories. my fav to reminisce about. What a sweet idea! I think I might have to copy it! Thanks for sharing! what a wonderful idea! how great to be reminded when you open the jar!! I love the new blog name! I'm 5'7" too hehe! And what a cute idea! I will definitely be doing this!